Plaster and gauze — the same materials used in medical settings for traditional plaster casts — can add excitement and dimension to your art shrines and assemblages. 5. Dip gauze all the way into the water, and remove it quickly. The longer it sits in the water, the more plaster washes off the gauze, and the less rigid the final results.Also, it’s not necessary to squeeze water out of the gauze. 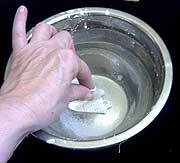 In fact, if you squeeze the water out, you may also lose some of the plaster. 6. Drape the wet gauze directly onto the surface that you’re embellishing. Once you have it in place, you can flatten it if you want less texture; otherwise, just leave it where it is.In this photo, the cigar box had been gesso’d before embellishing. You can gesso afterwards, if you prefer. It doesn’t make much difference in most cases.This gauze will stick to untreated Altoid tins, without gesso and without removing the paint first. If it starts to lift up after the gauze dries, the paint and sealer usually act as glue to reattach the gauze. 7. To vary the texture of the gauze, you can smooth parts of it with your fingers, gently spreading the plaster so that it fills some of the holes in the gauze. I like to smooth no more than 50% of the gauze in my art. The holes will catch the paint later, so that your finished piece will look even more ancient and mysterious. 8. When you have the look that you want, leave it alone and repeat with another piece of gauze, adding more layers or areas of texture to your surface.The gauze sticks to itself best when wet, so it’s good to get all of the embellishment on the item in one sitting. 9. You can speed the drying time by heating the gauze–after it’s in place–with your embossing gun. However, be sure not to scorch it. 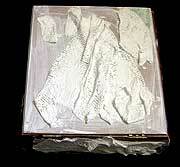 In some cases, the painted surface of the object may bubble or melt under the extreme heat of the embossing gun. Use it cautiously, if you use it at all. Heating is not necessary, and even if with extensive use of the embossing gun, you should still wait at least an hour or two before painting the gauze. In general, it’s good to let the gauze dry overnight rather than rush it with heat. It’s not necessary to cover the entire surface with gauze. In fact, I recommend leaving part of it untreated. 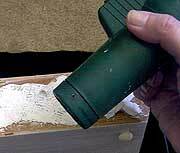 Let each surface dry to the touch before moving the box to embellish another side. Wet gauze can slide off the box if it is tilted too soon. 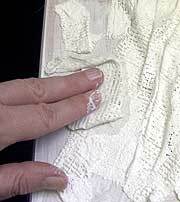 click to see larger A mix of smooth and rough areas on the gauze will result in a more interesting and varied painted surface when the embellishment is complete. For best results, cover the gauze with at least one coat of gesso before painting it. 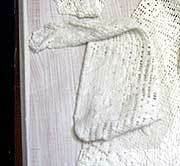 Be sure that the gauze is fully dry before applying the gesso, or the gesso can seal the moisture inside the fabric.